How did you come to decide that photo editing was what you wanted to do? I discovered that when I was the intern at National Geographic. I had just graduated from Western Kentucky University with a degree in photojournalism and my goal was to become a newspaper photographer. I did the internship at National Geographic and discovered a passion for editing and other people’s work. After the internship I still pursued my path as a photographer but after a few years I realized my true passion was for editing and facilitating the work of others, to help other photographers achieve and make great stories. I was in a tightly-knit group of friends. We were all photographers, we were all looking at each others’ work, and really, I had more passion for other peoples’ work than my own. I felt I was much more effective as a photo editor than I could be as a photographer. To be an editor for these great photographers and publish their work so millions see it—that felt more important to me. As a photo editor, you can also cover the entire world, be in many places at once. I remember a point at Time Magazine when I had a half-dozen people in the field covering six huge stories. A single photographer can’t do that. You’ve moved from the New York Times to Time Magazine to Wired to National Geographic. Does the same kind of visual sensibility carry through between these places? It definitely does. While the content between these publications is different, particularly at Wired, the one thing that carries through is your aesthetic and appreciation for great photography. I worked with great photographers at Wired who were conceptual still life photographers, product photographers, portraitists. They were great in their genre. To be able to assign and collaborate with photographers across many genres is part of what I’ve liked about my career, that I haven’t done just conflict photography. And the move to Geographic was natural. The kind of storytelling we do there encompasses a lot of genres and topics. It goes well beyond photojournalism—it’s about great photography. How did you prepare for those jumps? I did my homework. I knew Wired’s aesthetic and the kind of work they did. One of the great things about going to Wired was the opportunity to work with the great portrait photographer Dan Winters, who I love. But I wanted to bring in something new as well. I introduced Wired to a lot of photographers they hadn’t worked with before. There was a story we did about illegal sand mining in India where we worked with the Australian photographer Adam Ferguson. I’d worked with Adam a great deal at Time and I knew he had a history of working in India. Another photographer I brought to Wired was Moises Saman, who I’d worked with at Time and the New York Times, mostly in Afghanistan and Iraq. Do you think your time at Wired influenced your aesthetic? Has that carried over to National Geographic? In some ways, certainly. My first big story at Geographic was with Moises, doing a story about ISIS in Iraq and the aftermath as the Iraqi army retook major cities held by ISIS. We turned to Moises for that story because of his expertise in working in the region and in difficult situations. So far, he’s the one photographer I’ve worked with at four different publications. As for Wired’s aesthetic, it doesn’t much apply to National Geographic, which is such a different publication. Wired is very much punchy and poppy and flashy and Geographic is more traditional. We don’t do a lot of still life or conceptual work at Geographic, we do more long-form storytelling. That being said, I look forward to the opportunity to introduce some conceptual photographers to National Geographic, because we cover artifacts and applying one aesthetic to another genre could be interesting. How do you think your visual sensibility and your aesthetic have changed over your career? I think your core aesthetic remains, but you’re constantly influenced by new photographers and new styles of photography. Overall, the kind of work I like remains. I grew up on the Magnum greats—Eugene Richards, James Nachtwey. But that’s also evolved in some ways. There are certainly new ways of storytelling and that’s not even getting into the idea of the digital space and how it’s used differently. If your aesthetic doesn’t evolve, you’re doing something wrong. Your eyes are closed. Photography changes constantly, that’s what’s amazing about it. What kind of distance does a photo editor provide? When photographers are in the field making pictures, they have deep emotional connections to the experience and that experience doesn’t necessarily translate into a great picture. Editors aren’t emotionally connected to a photograph and that distance allows us to take a more neutral view. I can’t say how many times photographers have sent me pictures in which bullets might have been whizzing by, or bombs dropping, but without knowing that I think it looks like a very quiet moment. That’s a thing about conflict photography: pictures of guys shooting guns and pictures of guys being shot at aren’t necessarily great photographs. I’ve seen still pictures of scenes that seem incredibly quiet and boring, and there was a videographer next to the photographer and the video was the most intense thing I’ve ever seen. I’m looking at a photo like the reader would, and it needs to grab people. Context certainly matters, but sometimes the experience of making the picture is louder than the picture itself. Distance is important. Would you ever combine the two, have footage and a picture side-by-side? That’s a good idea. A lot of photographers in the last ten years have been shooting a lot more video. I’m a fan of atmospheric video—video that’s almost like a moving still picture. It gives you a real sense of place and photographers do them really well. As more newspapers move online, what’s your advice for newsrooms trying to decide how much focus to put on photography versus video? It’s really tough. What they need to realize is that video is much more expensive and time-consuming to produce. You have to weigh that balance. You might get a more expensive ad as a pre-roll to a video, but at what cost? But whether it’s video or stills, visuals are leading things. What they should really be focusing on are platforms beyond their websites. Even the idea of “social media” is dated—they’re just different platforms. Companies are struggling to monetize them but our goal as journalists is to reach as many people as possible. We do that through Instagram, through Facebook, through our website, or even our printed product. That’s ultimately our goal: to share stories. How much of a photo editor’s job is about selecting pictures? Selecting the pictures is a small part of the job. We do so much more: we’re travel agents, fixers, producers. We deal with invoices, we deal with equipment, we deal with other editors. Working with photographers on their projects while they’re in the field is the best part of the job, but it’s a quarter of the job. The rest is negotiating, advocating in the newsroom, in the layout room, with designers and other editors. Photographers all over the world are sending us pictures and it’s our responsibility to look after them. If photographers feel like they’re just shipping pictures into a black hole, they’re not going to produce good work. They need feedback, they need advocates. What’s the difference between a photojournalist and a journalist with a camera? What does a photojournalist do or see that a writer might not? They’re both thinking with their hearts and their minds, but the difference is what a photojournalist sees. They’re looking at things like light and form and body language that someone writing maybe wouldn’t notice or capture or care about. But a writer is able to write about sound and smell, the photographer’s not capturing that. Also, a writer doesn’t have to be there; photographers have to be there. Great war correspondents are up there with the photographers, but I don’t think they have to be. A writer can interview people about an experience after the fact—a photographer has to capture the experience. Is there a way to train reporters to take better photos? Some reporters will never be good photographers and if you try to make them into photographers, it’s not going to work. They have to have the desire and the passion and when they do, it means they’re open to critique and to listening; they’re open to learning. Everybody’s a photographer nowadays, but that doesn’t mean they’re good photographers. How do you help reporters? It’s just like how they got to be good writers: they read a lot, and they read good stuff. To be a good photographer, you’ve got to look at a lot of pictures, good pictures. It’s part of improving your visual literacy. And the internet makes it so much easier—when I was in college, we couldn’t just go online, to magnumphotos.com and look at 70 years of photography. To improve our visual literacy we had to go to libraries, bookstores, find books, order them. You’ve done these editing workshops around Asia, around the world. Are there any pervasive issues you’ve noticed in photojournalism across newsrooms? I did a workshop in Iraq where I think there was a lack of visual literacy, they weren’t getting exposure to outside media. I don’t think that’s a good comparison to Nepal. I did a workshop in Bangladesh and the problems that exist here and in Bangladesh exist everywhere: shrinking budgets because of shrinking advertising revenue. One thing that’s clear in both places is that there’s some amazing talent that’s undiscovered and untapped. That’s the exciting thing about coming to Photo Kathmandu: I get introduced to work I haven’t seen before, photographers I hadn’t heard of. I keep hearing over and over again that there are no outlets in India except in the exhibition space. When photographers do make a sale or do a project, the pay is so nothing that it’s not even worth it—that all the opportunity is in exhibitions or in working for Western media. 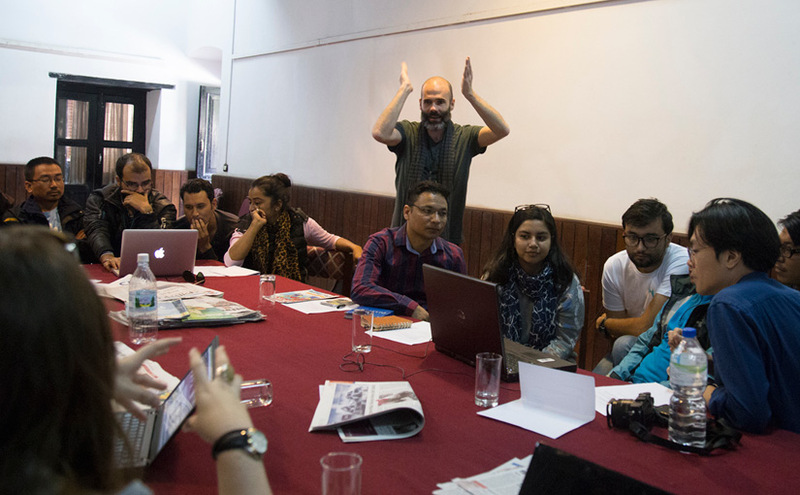 What’s your impression of photojournalism in Nepal? I have a limited view, but in teaching a workshop what I’m hearing over and over again is that photographers are treated here like the service industry. There’s a lack of photo editors, which means photographers lack a voice in the newsroom. A lot of decisions, from what I’m told, are being made by people who know little or don’t care about photography. But the photographers I’ve met are all talented. They want their pictures to be seen and they want respect. How to fix that? A lot of it is institutional. Photo editors are a necessity, there has to be that voice in the newsroom. When there isn’t, the whole place suffers. I get it: why would a text editor care about pictures? As a photo editor I care about text, but I’m not the one choosing the headlines. So why should they be the ones choosing pictures? It’s newspaper culture to think that text is more important than pictures—it’s a very antiquated viewpoint. For me, they’re at least equal and pictures are probably way more important, simply because there are billions being made every day. Who’s going to make sense of all that? Photo editors and curators. Who’s going to make sense of thousands of wire photographs a day? It takes photo editors to cut through the noise. There are little design things that I’ve noticed, too: papers aren’t jumping stories, so they have to cram all the words onto one page. If they did jump, you’d have more room for pictures, but they don’t want to do that, they want to get the whole story there. One thing I’ve noticed here—go to some of the Photo Kathmandu exhibitions and look at how people respond. Locals love them. It means they love great photography. Now go to the newsstand. Do you see that reaction there? You see tiny little pictures crammed into holes. There’s an opportunity here for a visually strong daily newspaper, something that stands out quickly, that would fly off the news racks. People would say, What is that? That’s amazing. Watch kids looking at these pictures. Even older people are reading all the captions and looking at the pictures and they love it. That tells me this is a very visual-hungry society. And I don’t think they’re getting those needs met by a majority of the publications here. What would you do if you were an editor here? I would experiment with a very visually-heavy Saturday edition and see what happens. Start a photo column, see what happens. One of the participants in my workshop said it best: with everything online now, you’re seeing instant responses to stories that are illustrated in a sophisticated way. Those stories are getting more likes; they’re getting more shares. You wouldn’t know that pre-Facebook, but now you do, as a direct metric—we use a strong picture, that story’s getting shared, easy. There are so many newspapers here and those days are gone in the U.S. Newspapers are dying left and right, even newspapers that did great photography. Rocky Mountain News in Denver, Colorado had an award-winning photography staff and three years later, the newspaper’s dead. That’s the positive thing I see here, that there are so many options and so many papers are still kicking it. They have big ads on the front, but so what? It’s a necessary evil, work around it. It doesn’t mean your pictures have to be an inch tall. When you say “take a photograph,” it implies that the photo already exists and you’re just taking it. But a photo is about the eye and the mind of the photographer; they’re not creating a photograph, but they’re making something out of what’s there. They’re making decisions—a little to the left, a little lower, a little further back—to capture this perfect moment. It’s the difference between “I want to take your picture” and “I want to make your portrait.” Those are two different ideas. I still say “take a picture” but that term is a little cheap, as is taking “snapshots,” “snaps,” “shots.” I want to elevate the position of photographers and photography. It’s a tiny thing, but I think it matters.